Rowan County’s farms are rich in history, and we are blessed with dedicated preservationists who take pride in restoring our treasured structures and saving our sprawling landscapes. But we’re also passionate about progress, and our farmers keep up with the demands of operating successful, modern-day businesses. It’s no wonder folks wasted no time snapping up every last ticket to Historic Salisbury Foundation’s Century Farms and Barns Bus Tour, which offers a chance to explore some of the county’s notable farm houses, barns and working farms. Two buses – a total of 92 seats – quickly sold out. Each site on the spring tour was chosen for its historical significance, and all are “century farms,” documented as having been continuously owned by a single family for 100 years or more. “Since this area is one small sample of the rural beauty and family histories of the farms of Rowan County, we hope to do a tour again next year featuring another section of the county,” said Historic Salisbury Foundation Events Coordinator Leah Campion. Villa Franca Estate, located at 4530 Patterson Rd. in China Grove, is a popular wedding venue featuring four acres of meticulously maintained gardens and hundreds of acres of cultivated fields. 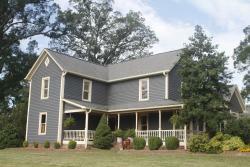 Dating from 1859, this landmark of the Mill Bridge community was built for Civil War surgeon Dr. Francis Neely Luckey. Dennis and Ginger Black bought the home in 1998 and restored it to its current condition as their home, later deciding to share it with the public as a wedding and event venue. Along with acres of well-kept farmland and rolling pastures, the Blacks maintain a farm animal petting zoo for visitors to enjoy. Located at 350 Saw Rd. 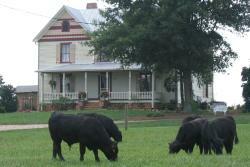 in China Grove, Circle D Farm sells family raised, grass-fed beef that is free of added hormones. Customers buy ribeye, tenderloin, New York strip, sirloin, ground beef, roasts, stew beef and sirloin tips in 40- to 50-pound shares. Six generations of the Deal family have farmed and depending on this Rowan County land since 1842. From the 1900s, the farm has featured a sawmill and brickmaking business, grown sweet potatoes, corn and wheat, and raised hogs before specializing in beef. All cattle are bred, born and raised on the farm, and the Deals make their own hay and feed from barley grown on the farm. From their farmhouse to the original 1901 barn, the Deals are committed to preserving the heritage of Circle D while operating a successful, modern business. 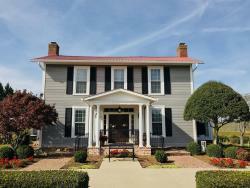 The Waggoner homeplace is named after its builders, Chal and wife Nancy Collie Waggoner. 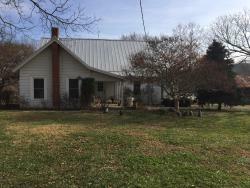 The property was boarded up after their departure in 1948, with the cows in the surrounding pasture often making themselves at home on the front porch. In 1958, James Harvey and Margaret Campbell Corriher purchased the property and remodeled the home, preserving original birch paneling harvested off the property and adding two bathrooms. A dining room was added in 1981 and a sunroom was built in 1995. After the Corrihers’ deaths, the property was deeded to their daughter, Julie, and her husband, Lonnie F. Hoffner. The old oak trees still surround the roadway, and the original muscadine vines produce sweet grapes each fall. 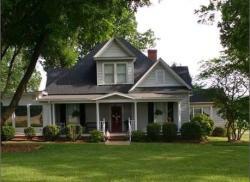 The home continues to be a treasure of the Corriher Springs Road neighborhood. The historic Corriher Grange Hall, located near what is known as Five Points in Rowan County’s Enochville area, was built in 1916 for use as a school. A gable front was later added to the original one-story frame building, which served as the community school until 1935 when it was acquired by the local Grange for use as a meeting hall. The Corriher Grange then served as a place for farmers and families from the Concordia community to gather. The building was listed on the National Register of Historic Places in 1982. Henry Clinton Corriher was the great-great grandson of the first “traced” Corriher to arrive from Germany and settle in Rowan County, and the circa-1870 farm that bears his name has been in the same family for six generations. At one time, Henry and wife Polly Clarissa Beaver Corriher, grew 19 varieties of apples, had grape vine arbors all over the yard, and lived sustainably off the land. The land is now leased to Henry Corriher’s relatives to grow field crops. The old log barn and smokehouse were believed to have been built right after the Civil War. No documents were kept to confirm, but Henry&apos;s granddaughter, Mildred Corriher Goodman, recalls her grandfather telling her they were built around 1868. Henry&apos;s great-great granddaughter, Adele Goodman, took over what was left of the farm in 2012 after her grandmother Mildred&apos;s death. Today she maintains honey bee hives and keeps alpacas, a donkey, guineas, and chickens that are more pets than farm animals. Moses Corriher and his wife, Geneva, built this two-story, wood frame house in China Grove around 1902. The farmhouse, which was expanded as the family grew, remains in Corriher hands today. Grandson of Moses and Geneva, Darryl Corriher and his wife, Barbara, have remodeled the house and raised their family there. Keeping the character of the house intact, the Corrihers have retained the original hardwood floors, fireplace bricks, beaded board ceilings, and exposed beams. “We enjoy living in this house because of its history, connections to our family’s heritage, and its beautiful setting,” Darryl Corriher said. Moses Corriher grew watermelons, cantaloupes and corn, and the family raised cows they milked, chickens for their eggs and meat, and horses for plowing. Darryl currently grows corn for grain, wheat, barley and soybeans. The farm now consists of 270 acres and has continuously been farmed for over 115 years.